I can only hope that my legs will forgive me. I’ve been a “cheap plastic razor” user since 1985. But I’ve just been introduced to a brand new Rose’s Razors opportunity and suddenly I feel like I’m using a luxury item (without paying luxury prices or even shipping fees!). Well, my SIL will be so proud of me. While I had upgraded from the cheap-cheap razors to a cheap one a few years ago, I still had not even looked beyond those that were pink and flimsy. Then I got a call from Rose’s Razors and here we are, partnering together to fix all of women’s shaving problems, one wonderful razor at a time. Sound dramatic? Ask my legs how they feel about it. The difference in razors is not an exaggeration. And the difference in price is so tiny it makes this switch a no-brainer. The Rose’s Razors family worked at length to design and create a handle that is perfect for women. I’m so used to the flimsy ones that I truly felt like I was handed a luxury item. The razor gives such a smooth, comfortable shave that I can’t help but be a little bit gushy right now. And while it feels a little awkward to share, as much as I like it for my legs, I like it for my pits even more because they are, of course, more sensitive. I think they are actually smiling about this experience after so many years of abuse. Great at Rose’s Razors are, I wouldn’t even tell you about them if they were too expensive to be practical. This is what makes me so happy, because they are a great product and they are surprisingly and wonderfully affordable. I mean, they only cost a little bit more than the cheap ones I’ve been using. I can hardly believe it. And the options!! You can buy a subscription if you want them delivered to your door every two months. You can select from a variety of subscription options and change it at any time. Or if you don’t want a subscription, you can simply buy a package of razors (with or without a handle) any time you need it. Best news yet: Shipping is always FREE, no matter what your subscription or order! Well, the only thing better than all of this is that Rose’s Razors is offering a giveaway and a discount to all of us here. Sign up below to win one of two Short Stem Boxes. These boxes are awesome as they contain a handle and four wonderful blades. 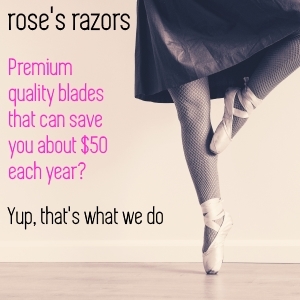 It’s a great way to get started with Rose’s Razors! And how about the discount? They are giving Heavenly Homemakers readers 20% off our first purchase, no matter the size! Check out all of the Rose’s Razor product options here. Use the code Heavenly20 for the discount to apply. Code expires December 31, 2017. Enter to win this great giveaway below! I’ll draw two random winners on Friday, October 20. I was just thinking I was grateful winter is coming so I don’t have to worry about shaving….with these razors, I could still shave during the dry, cold months and my husband would be a lot happier—lol. Thanks for the chance to win! This would be a nice upgrade for me too! Don’t think of it as an upgrade, think of it as the shaving experience you deserved all along! I’ve always used super cheap razors, but I’d certainly be happy to try something nicer! So glad to see you’re interested! Give them a shot with our Short Stem Box. We think you will be really happy with the value we have been able to pack into this price point! I’m a mom and wife too, and realize all too clearly that we need to be smart with our dollars. That’s why I always try to give our customers as much value as we possibly can with our products. It may seem like a small thing, but a great shave is one of our little luxuries and we would love to make that possible for all women! I was just thinking the other day about trying to find a new razor…I am excited to look into and maybe try these! We hope you giving our little blades a try! Trust us you will love them! We sampled blades from over 30 different manufacturers and tested everything from sharpness, to how quickly they rust (ours don’t – they are stainless steel), to their ergonomics before settling on a winner. Keep in mind that even if you sign up for a plan, they can be modified, paused, or canceled at any time so there is no pressure on our lovely customers. It’s a smart thing you bringing up winter! Our skin tends to be especially dry in winters because of the heating etc. This means it is much easier to irritate our poor skin especially if you are using cheaper blades (I was guilty of this too). Our suggestion (even if you choose to purchase your blades elsewhere) is to over exfoliate and overmoisturize. The exfoliation will help immensely with shaving and overdoing with lotion will help to keep your skin nice and dare I say it… moist! I think my legs would be happier too, with something better! They sure would Lori! Your armpits will sing your praises too we think! I’m excited to try this! I buy the nice subscription razors for my husband and the cheap plastic ones for myself. Lame! Hehehe – one look at these and your husband will be the jealous one! We think this was a long time coming! Excited to learn about quality razors at an affordable price!! Had never heard of this company, so appreciate your sharing your experience with them. We are young, but we have spent well over a year making sure our products work exactly as they say they will! After all, you only get one chance to make a first impression! I’ve never heard of them but would definitely want to give them a try. We are indeed a bit on the new side, but we would like to think that allows us to deliver a lot of value to our subscribers. While we have opened our doors recently, we have been testing and refining our product for a long time now (and will continue to do that going forward). We would love for you to give us a try and let us know if we met your expectations! They sound good, and I like the introduction to a subscription service for ladies. First off, I love your profile pic! And yeah, it was about time right? It took a little work to make sure we fixed some of the design flaws found in the other brands and the mens subscription razors, but we are happy we did! Hopefully, you’ll be as happy with the results as we are! I’d love to try this! I hate the price tag on “good” razors. That makes two of us! $5 refills are just bonkers. I am so happy we are able to get premium blades to our clients at a MUCH more reasonable price. Our goal is to continue to improve pricing as time goes on and our subscription base builds, our customers deserve that much from us right? I’ve never used anything other than cheap plastic razors, either. I’d love to see how awesome they are! Be careful here, once you try them you will never go back to disposables! I could use a new razor! we would love for you to give us a shot! We tell all our first time customer to just try the little box or pink subscription. If you’re happy with us you can upgrade, if not, it’s a low-cost way to experiment. I was just thinking of trying out a razor that maybe cost a little more for the comfort of my legs! I’m not sure what you’re using now but our razors are in line with the $5 refills that you see in your drug store (we just don’t think $5 is a fair price). If you’re switching from a disposable we think you’ll love them. That said, we would also kindly ask that you take a look at our blogs. We have some tips in there that may be able to improve your shaving comfort with any blade that you use! Thank you so much for sharing your comments! We do hope you love your razors and would love to get a review from you after you have a chance to use them! I’d love to try Rose razors, I’ve never heard about them! I’ve been using the “fancy” ones but they do cost a small fortune! We would love for you to give us a try Olya! We would put our blades up against any of the premium brands. One thing you may notice is that our heads are smaller and much more maneuverable. We do so hope you’ll love them as much as we do and at half the price too! I’d be excited to try these and see how they compare to the “grocery store” razors I normally get. We would love the chance to go head to head vs. the “Usual Shaving Suspects”! We’ve run those comparisons while we were testing and did our best to make sure we provided our subscribers with an amazing product. We hope that after testing them yourself, you would agree. I would love to win this and compare to another one that costs way too much for me. We will be rooting for you! Even if you don’t win though, we hope you would still give us a try. We would love to see you as a happy customer! Thanks!!! I hate cheap razors but I also hate the cost so it sounds like a great solutions. That was precisely the thinking behind Rose’s. We also wanted to make it convenient. Let’s be honest here, you have MANY other things on your mind right? If we could save you just a little bit of time with our free home delivery, we think you’d probably be happy with that. We are so happy to be working with Laura at Heavenly Homemakers and all of you too! For those that already ordered, we thank you from the bottom of our hearts! It takes courage to shake up your regime (even if it’s something as small as your razor). For those still on the fence, we hope you will fall our way, we will do our best to ensure that you never regret it! As you Lovely Ladies peruse our site and check out our products please be sure to contact us if you have any questions or suggestions. We look forward to building a great brand that you can count on and enjoy for years to come! So glad you’re thinking of us for your Family! If there are going to be multiple users we generally suggest pairing a larger plan (Red or Gold) with a one-time small box purchase. This way everyone gets their own razor and you can share blades at a lower cost. We will be introducing some great products over the next few months and look forward to seeing both you and your daughter as happy customers! This looks a bit pricier than dollar shave club (which was my recent upgrade from the super-cheaps), but I also think the dollar shave blades wear out quickly, so I’d love to try these–especially if the handle is better! These actually work out to be around the same price of the top end razor from DSC. The difference, we think, is that we included a trimmer blade and our handles are perfect for shower shaving. We have also heard that our heads are less likely to break. But don’t take our word for it! Try a box and let us know what you think. We are always looking for suggestions to improve. Cheap and quality? Yes please! There’s no reason why you can’t (or shouldn’t) have both! Definitely could use these for the underarm area. Your underarms will definitely thank you, Sue! But don’t forget your legs, they’ll get jealous! Interested in these. Great when you don’t have to remember to pick stuff up at the store. If we can save you a trip to the store then you have a little more quality time with the Little One! Definitely a win in our book. I’m right there with ya! Can’t wait to check these out. Treat yourself Jennifer, You deserve it! We would love for you to give our Short stem box a try to see if these are right for you. We think the jump in quality will speak for itself! Was just telling myself yesterday that I need to stick with the cheap plastic razors for our budget now that I have teen daughters and one 12 year old. But I didn’t realize that the cheap razors more easily cut your legs. That’s why my poor oldest has such a hard time with cuts up and down her legs! I am going to figure out the most cost effective subscription and get enough handles etc. for all of us. Merry Christmas to the girls! BTW, how long or how many shaves should a blade last? Thanks! In doing research for this we actually spoke to 5 different dermatologists and another 7 aestheticians. They suggested that razors should be used for between 5 and 7 shaves before they need to be replaced. To be honest with you, we were using ours WAY more and when we told them this they asked us if we got either razor burn or razor bumps (I did). After we started Rose’s and I started switching out my blades more often I noticed far less burn and bumps went to near 0. We will be writing a blog on this shortly but we would refer you to our current blog on razor bumps. If you want less irritation follow the steps there. Also if you are looking at supplying the whole family we would humbly suggest getting a Red or Gold subscription and then getting a small box. That way you get the auto delivery and everyone gets their own handles. You’re more than welcome Marie! We are more than happy to pick up shipping for our customers. It keeps things on your end much cleaner and means you’ll never be ‘surprised’ by hidden costs. I hate hidden costs as a rule – that’s why my husband handles the cell phone bill. I go a bit batty everytime I see it! I’ve been using by husband’s men’s razor that I buy in bulk at Costco. So has our teenage daughter. This sounds like it could be a leg and armpit shaving game changer! My husband now uses my razor (how often do you hear that)! He loves the edging blade for his sideburns and swears they are better than his old Megabrand Premium blade! I want to try these! I used to buy the cheap-cheap razors, and a package of them would last me years. Recently my sister convinced me to buy cheap razors, which I found I cut myself even more with! I think I am going to order myself these! We are so happy to have you as a prospective customer! I do think our blades will make you, and hopefully your sister, very happy girls! I would also suggest you go check out some of our blogs. I know it may seem silly but we realized after surveying about 500 women that most of us aren’t shaving properly. It may lengthen your shave by a minute or two but those cuts you spoke of will be a thing of the past! I’m guilty of the use-the-same-blade-for 5months syndrome. My sister enjoys a similar subscription mostly made for guys so I’m excited to get a chance to try this and see! Oh my! We are so sorry Melissa! We are looking to open shipping to Canada by early next year. You’d never believe how expensive it is to get things to our Awesome Northern Neighbors. But don’t worry, if you win we will definitely honor the contest and get them to you! I understand the expensiveness of shipping across the border! I just went to Wal-Mart and bought more cheap razors and my legs are not happy. :( Definitely need something better! This sounds like a great option to try. Thanks for having this giveaway! We would love if you gave us a try (we think you’ll love them)! We are really happy to be working with Laura and all her lovely readers! I was just looking into a nicer mail order razor this week as I’ve only used cheaper ones that are subpar! I would love to win this! We wish you luck Kimberly! Thank you so much for expressing interest in us. lol I am totally up for jumping off the cheap razor train! All Aboard for Rose’s Razors where every seat is 1st class! Yeah, we thought so too. And really, it shouldn’t feel like a crazy expenditure. Every woman should be able to get a good shave right? I was just thinking the razor I’m using right now is about 2 1/2 months old! It happens Kristin – especially since we have so many other things to deal with (little ones are back in school)! That’s why we setup the plans – no more trips and no more forgetting. Newer razors are less likely to harbor bacteria so there’s a reduced chance of shaving bumps – that’s a win in our book! Sad to say, still on the cheap razor train…maybe I’ll win and this will change my life forever. Hahaha! We would love to have that kind of impact Cammie! We wish you the best of luck with the contest but would love to see you as a lifelong customer either way! We’ll do our best to continue to earn your patronage every day! I’m thinking my legs and my husband would love these???? Oh yes! Schedule date night now! After he holds the handle and feels how smooth your legs are you may have to get him one too! We’re happy to count quite a few men amongst our subscribers, they love the edging blade almost as much as we do. I am as frugal as anyone, but there are a few things to never go cheap on! Razors are one of them. (Scotch tape is another, if you were curious). ???? Totally agree on both of those, my husband went cheap on tape one year during Christmas time. Suffice to say, that was a mistake! I love my boys, but I’ve learned that I can’t send them to the supermarket or the hardware store unsupervised. These razors look great! I would love to try them! I’d love to give these fancy razors a try! Thanks for the giveaway! We think you’ll love em Kimi! More than happy to add a bit of fancy to your life without the fancy price tag! Well Azeem, you know what they say? Women love Roses! Actually, a lot of guys do too ;)! I am always looking for a better option in razors and looking forward to trying these razoes very soon. Hopefully, you’ve given them a good try and love them. We would love to hear what you think about them! These sound awesome! I am always on the hunt for a better razor! Your hunt is officially over Melanie – consider these your trophy! wow, that is some razor! If I’d win, I’d certainly give this a try. We would love for you to give us a try. 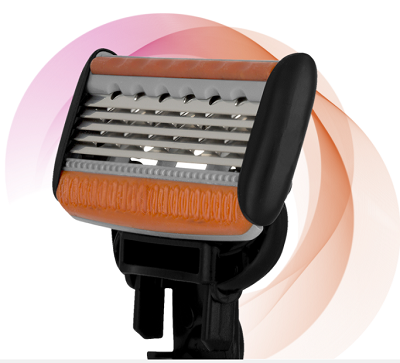 We think you will love the new razors! We think so. The best part is that they perform as well as they look! I’d love the chance to try these. It would be great to have a better razor than the cheap cheap ones, but still affordable. That’s the goal Mary. We are also hoping to make them more affordable as time goes on (through volume discounts and the such). We were able to give ALL of the discounts to our customers on this past round and we will continue doing that in the future as well. These razors sound wonderful. Thanks for sharing another great product ! Laura is always ahead of the curve right? That’s why we are so happy to work with her and the Heavenly Homemakers Audience! I have 1 razor left & then I’m looking into these. I have had so much trouble with razors that hurt while shaving lately. Excited to try something different. Great to see that you are looking into us! So sorry that your current ones hurt though. As a small suggestion, you may want to look into some of our blogs (how to avoid razor burn), we go through a few suggestions that I think may prove useful. We think they are! Give them a shot and I think you’ll be convinced too! One thing that is hard to portray on the interweb is the feel of the product. Laura is much better with words than I am, but it was the hand feel that really convinced me that this would work for our customers. I love hearing about new, quality companies on Heavenly Homemakers! The only downside is they rarely ship to me in Canada, or the postage costs more than the item. I’m either doomed to poorly shaved legs, or paying ridiculous amounts for quality razors. Even mens razors seem way overpriced where I live. Oh well ???? Currently, we don’t ship to Canada for just that reason (shipping would make it prohibitive and destroy the value for you). But we are already looking into setting up distribution there that would keep costs lower. Hopefully, you entered Laura’s contest too – even if you’re in Canada we are happy to ship you a set if you win! 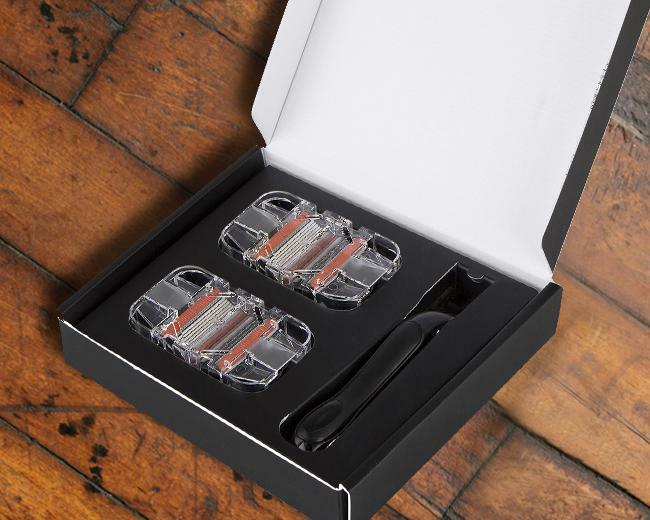 I ordered a box of Harry’s Razors for my husband and father last Christmas; nice to have a women’s option! By the way, I wonder if the company should look at making the handles a rose color? Thank you so much for the suggestion! We will be adding more handle colors over time. This is especially useful if there are multiple shavers using the same bathroom! I hadn’t heard of these before- very exciting! We are new to the market but the company is actually a little over a year old. We took a lot of time to test and perfect our products because we demanded perfection. Based on the feedback – it was the right approach! My legs are a tough shave – I’d love to try these! We’ve got you covered Sarah. I have rather coarse fast growing hair as well, so if it didn’t work for me or became blunt too soon, we cut it from the list of possibilities a long time ago. That’s all we ask really, give us a try. We think you’ll love Rose’s! How fun! Would love a better shave. So would my husband! He’ll be swiping your razor soon enough! I would love to win these so I can try them! Best of luck with the contest Caroline! They feel even better Tabitha! Try a box and let us know what you think! It would be nice to insert a little “luxury” into everyday life without a price tag that takes away the fun. Great products don’t have to come with equally ‘great’ price tags. Some of the best things I own were flea market finds! We would love to count you amongst our happy customers! That’s exactly what we are here for. Many women who have used both prefer Rose’s Razors because they were designed for female usage habits and the connector is far less prone to breaking (nothing is more frustrating that plugging in a new blade and then it breaks on the first shave). I’m so cheap with razors! Luckily my skin had been forgiving, but these look great! These will be a real treat for you Lee! Your skin will definitely thank you! Can’t take yourself too seriously… life’s WAY too short for that! This is pretty cool! My husband has some special kind of non-disposable razor and loves it. Once he sees the one you get from Rose’s I guarantee he will be hit by a pang or two of jealousy! I would love to try Rose’s Razors. I was recently out of town and while away my husband “cleaned” our bathroom and threw away my razor, so now I’ve been using a plastic disposable one for weeks. Oof! My husband’s version of cleaning is roughly the same. I try not to leave him home alone. Ditch the Pink Stick Julie! We think you will be happily surprised by the shave you get with Rose’s and look forward to your thoughts! For sure Jessica, at least this way you don’t have to worry about what the old razors are harboring too! I have been using the $5 refill type for a decade… and I tend to keep them way too long because $5 is too expensive. It’s time for an upgrade! Yes indeed Anitra, $5 IS way too expensive. We’ve managed to cut that in half and get them delivered to you. Hopefully, you’ll love the convenience, the cost, and the quality! I’m totally intrigued! I just use disposable plastic razors… and stretch their use way longer than you’re supposed to! Not to worry, now you won’t have to! Our subscription plans are as much a reminder as they are a convenience. Old razors can be bad for a number of reasons (rust, bacteria, worn edges causing ingrown hairs). At least this way when you get a new box you know it’s time to change out your blade. Thanks for a chance to win these! I know the contest is over but we would love for you to give our shavers a shot. We think you’ll feel like a winner regardless! I have never heard of these razors before! I’m excited to try them!! They sound heavenly! We think they are for sure! give them a shot and let us know what you think too. I am a cheap razor kind of gal, so I would love to see what a good razor feels like! I’ve been thinking about a razor subscription…..glad to know about this company! Happy you found out about us Melissa! We’d be honored if you gave us a shot. We promise not to disappoint. These sound like great razors, I love the idea of having them delivered and the price really is very good. Convenience, Convenience, Convenience! I have two young boys, a slightly insane husband (aren’t they all?) and a crazy family. We did whatever we could to make the whole process easier and less expensive. I look forward to trying them! And we look forward to serving you Shara! Would love to try these out! Cheap razors and coupon shopping has been my mo! We wanted to give women back two of their most precious commodities, time, and money. Hopefully, we’ve succeeded! I don’t buy the cheap razors because I have too sensitive skin and cut myself too easily with them, but I hate shaving and do not shave often and probably use the razors longer than I should before finally switching them out. However, I still get bad razor burn and would be interested in trying something else, especially something as affordable as these. I was surprised with the price. I expected at least what I currently spend if not more and I was excited to see that they are comparable, if not a little cheaper. I have sensitive skin too and shaving used to be a major bummer. We are looking at fixing that though. Just a heads up, the razor is important, but we cannot undersell the importance of good shaving technique (you can check out our blog on razor burn). We are currently developing some products that will help to significantly reduce any discomfort when shaving. If you are a customer or you signed up for our list you will be alerted as soon as they come out. Also, the price is a shock to a lot of our first-time customers but happily, they are equally shocked when they actually receive the product. We will never sacrifice on quality – ever. That’s a promise I personally look forward to keeping. I would love to try Rose’s Razors! We would love to count you as one of our Prized Customers Elizabeth! Give us a shot, we promise we won’t let you down. These razors look awesome! I’d love to try them! We would love to count you as one of our happy customers Rachel! OK Ladies. I’ve tried them now and all I can say is “wow!” I am impressed. First of all, shipping was FAST. Ordered on 10/13 and received on 10/17. I opened them right away and was MAJORLY impressed by the quality. I have been buying middle grade razors so I wasn’t expecting anything better than that. Boy, was I wrong. This is a REAL razor. The handle is metal and solid. Very impressive. So, I took my shower this morning and had a wonderful shaving experience. Who knew that shaving could be an experience?? The handle feels great in my hand. The razor give a really good, close shave. I feel like I indulged in a real treat without even meaning to. I am so glad I jumped and purchased and I don’t think I’ll be looking back!! We are so happy you love them!! We do hope you would be kind enough to leave a review on the site as well. We all look to each other when hunting for great products and a strong honest review is invaluable! We promise to keep the bar high for our next set of launches too. These razors are pretty! I would love to give them a try! Mid next year we will also have several color options you can choose from! I can’t seem to find a razor that I like, so I’m excited to try a new brand. We are so excited for you to give us a shot. We’d love to hear your feedback when you try them! Bummer! I was told that they are not allowing more entries and that’s weird because I just got the email today. Oh well, at least we get the discount, right? Yes, the discount is good!